They’re so easy. My 3, 5, 7, and 10-year-old made them. Dip them in white chocolate and then decorate with black frosting. They sell tubes of black frosting in most baking aisles. I didn’t know if I should add faces because they started to look a little minion-ish. But my husband convinced me otherwise. 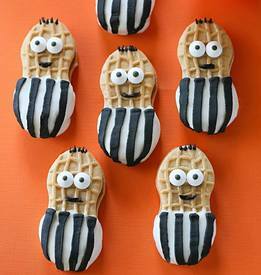 These are a fun treat for the Super Bowl!